If you've ever spent any time staring at building floor plans, this chair may look familiar. That's because it's inspired by the way architects draw chairs in their plan-view drawings. These chairs, called Satellite, are the brainchild of Richard Hutten—himself no stranger to drawing inspiration from the technical world. 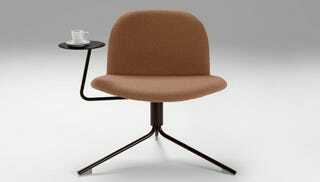 It's a simple, circular swivel chair supported by three solid steel legs, that features an upholstered seat and back and a side table that orbits 180 degrees, making it work equally well for left- and right-handed sitters. "Architects always draw circles very fast to indicate where to position chairs on their floor plans. I thought that was a nice gesture, so I drew a circle and said that it should be the top view of the chair. To me the circle is the most elegant form, there are no bulky sides and it can go in all directions, which means it's never out of place."